· In today’s world, more than ever before, young graduates need a competitive edge to secure jobs, placements and internships. · Employers are always on the look out for the best! Employable graduates who are well rounded, not just educationally, but also intellectually. · Graduate to Corporate (G2C) offers the necessary training and certification to help you develop a robust skillset that will give you that competitive edge and better position you to secure your DREAM job through access to a bespoke network of like-minded individuals and key people from corporate organisations. 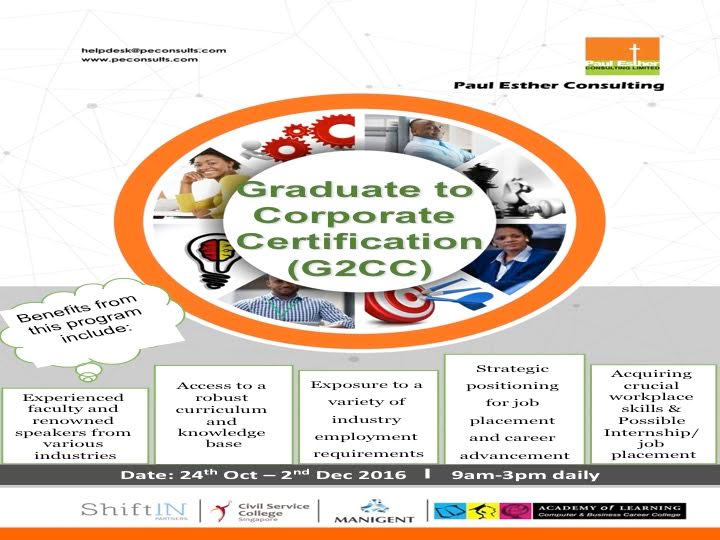 · G2C has partnered with corporate organisations to provide a rich pool of certified employable graduates - this is fast becoming an employment prerequisite for many organisations. · Apart from training modules on personal leadership, business ethics, relationship management and developing presentation and public speaking skills, the program also incorporates training on etiquette and social graces, financial planning, time management and access to renowned motivational speakers and corporate personalities.